Corn tea is a classic Korean beverage. When made from corn kernels, the tea's primary benefit is hydration due to its water content, but you'll also get small amounts of nutrients, such as carbs, vitamin C and folate. Corn tea is also brewed using corn silk. This type of tea may work as a diuretic and help stabilize blood sugar. Corn tea is made two different ways. One method uses roasted corn kernels, while the other makes tea from dried or fresh corn silk. For both types, the ingredients are placed in boiling water and simmered for about 20 to 30 minutes. Then the solid ingredients are strained out, and the remaining water is served for tea. The tea should keep in the refrigerator for about a week, but it tends to spoil quickly. If it begins to turn cloudy, it's time to dispose of the tea. Roasted corn tea works well for hydrating your body. In fact, corn tea is consumed just like it's plain water in Korea, according to a study published in Nutrition Research and Practice in October 2014. 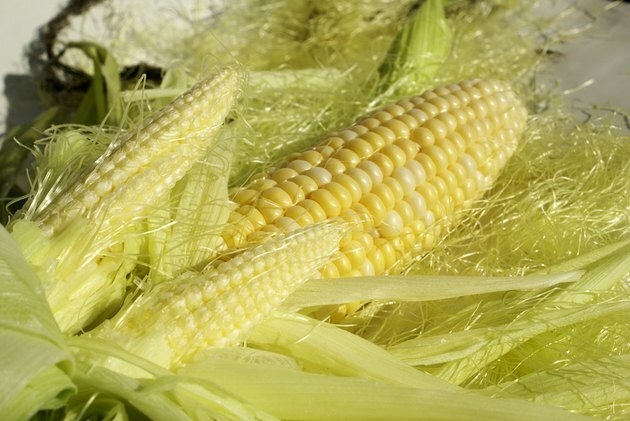 In addition to the fact that roasted corn tea consists mostly of water, it also contains sugar from the corn. The exact amounts of nutrients you'll get from a cup of roasted corn tea depends on the proportion of corn to water and how long the corn is simmered. A percentage of some nutrients will leach into the water, however. A cup of uncooked corn kernels contains 14 percent of the daily value for vitamin C, based on consuming 2,000 calories daily. It also has 11 percent of the daily value for vitamin B-6 and 12 percent of folate. As a general guideline, about 35 percent of the corn's folate leaches into the boiling water, reports the U.S. Department of Agriculture. You can also expect the water to contain about 25 percent of the total vitamin C and 15 percent of vitamin B-6. Tea made from corn silk is different from roasted corn kernels because the silk is a mild diuretic, which means it promotes urine production. Studies using laboratory rats support its role as a diuretic, according to a review in the journal Molecules in 2012. These studies observed rats that received a specific amount of corn silk extract, however. Because you won't know how much is in your cup of tea, be cautious about the amount you drink until you know its impact. Also be aware that the tea may increase the amount of potassium excreted in urine, so it's not the best thing to drink after you've been losing electrolytes through sweat. Corn silk extract made by boiling dried silk in water also improved blood sugar levels in lab mice, reported Nutrition and Metabolism in November 2009. Does Rooibos Tea Affect Iron in the Blood?